"What is this conference all about? And what am I going to get out of it?" How hard is it to choose right from wrong? It's wrong to steal; it's wrong to lie. Those things are "easy" to figure out, right? Do you know what you would do if you were confronted with situations which were not that "easy"? For example, what would you do if you were confronted with situations such as those described in the three scenarios below? In this Conference you and your peers will discuss with West Point Cadets as your facilitators scenarios such as those. In this short one-day Conference, we will help you explore your personal values - the guideposts that you can use as you make decisions for yourself and for others. Understanding what you believe and internalizing a personal code of conduct will make you a stronger leader in uncertain times and a leader that others will trust and follow. West Point seeks through an intensive four year leadership development program to "educate, train, and inspire the Corps of Cadets so that each graduate is a commissioned leader of character..." In this Conference, selected students from the high schools in the Tampa Bay area will be given a brief introduction to West Point's leadership development program. 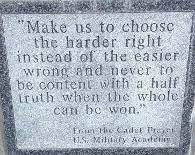 These three rules of thumb are taught to Cadets at West Point to help them act with honor in even the "grayest" of situations. 2. Does this action gain or allow gain of privledge or advantage to which I or someone else would not otherwise be entitled? 3. Would I be unsatsisfied with this action if I were on the receiving end? You are a good student and have been accepted at two colleges and are waiting to hear from three more. You will be the first from your family to attend college and have the support and pride of your whole family behind you. Your family is taking on a lot of debt to make this possible for you. You want to assist by earning merit scholarships. You hear from some friends that competition for these scholarships is intense. They say that everyone exaggerates a little on the application to get noticed, but it is the interview that is really important. You started your new job at the mall and are really excited. A lot of your friends from school shop and work there, and it’s a lot of fun. Your boss can be very demanding. Even so, you like her and think she is a fair boss and good to work for. Her expectations are pretty simple and clear, but she isn't one for second chances. One of your good friends works at the same store that you do. To say that she doesn't have the same respect for your boss is an understatement. In fact, she pretty much hates your boss and calls her a tyrant. One Saturday morning, your coworker arrives late for her shift and your boss reminds her of the "on time policy" and sends her home without pay. Your friend finds you at school on Monday to talk about your boss. "Can you believe it? What a witch!," your friend says. "Well, I'll get even - you'll see." You are on your school's Model United Nations team. Student teams research the position that selected nations adopt on various issues in the General Assembly. After developing a "position" consistent with the interests of a selected nation, students present this position with an appropriate rationale. Your school consistently does well and this past season, your team not only went to regionals, but won and earned a place at "nationals," held in <?<span>New York City. In preparing for the competition, your coach asked you to study South Africa, Chile, North Korea, Syria, Belgium, and Canada. She explained that these countries represented different continents, languages, religions, economies, etc., etc. Studying these nations would be "excellent practice." In addition, the issues she offered related to AIDS/HIV in Africa, independence for Kosovo in the Balkans, "the Lebanon question in the Middle-East," sanctions regarding nuclear weapons development in Iran, and international free-trade. Your team studied each of the five nations she assigned on each of these five issues. You and your teammates spent countless hours at the library, on the internet, and in spirited intramural debates. Finally, you were ready and the time came to travel to the "Big Apple." On the first evening of registration and welcome, your team received its assignment -- a very closely guarded secret, until now. To your amazement, you were assigned Syria and the issue you were given was "Independence for Kosovo." Your team was both thrilled and amazed. With 192 nations and dozens of potential topics available, to have been selected to represent one of the nations and one of the topics you had studied was a stroke of great luck. As you mingled with the other students and met key people at the conference, you noticed your coach talking with one gentleman for quite awhile. Upon inquiry, you learned that he was one of the organizers for the conference; he actually lives in Pinellas County and teaches at a local community college. Your team did very well on its first day and you know the judges were impressed. The wrap-up would be held the next morning with closing arguments and final voting. After dinner, the team adjourned to someone's room for study, practice, and then a good night's rest. Your coach mentioned that she was going to the lobby for "a minute." Thinking nothing of it, you went to bed. The next morning you woke early and headed down to the exercise room for a workout. As you opened your door and stepped into the hallway, you saw your coach entering her room. When the final voting was tallied, your team had won the National High School Model United Nations Competition. The story was on the news, in the papers, and "it was a big deal." On the plane trip back to Tampa you had a chance to chat with your coach. You made a casual remark about the weird luck of getting a country and a topic that you had studied and practiced for days leading up to the competition. Your coach said, "Yeah, it was," changed the subject and the matter dropped. .
Back in school on Monday, your team was recognized at an assembly and the trophy was proudly displayed along with the other championship memorabilia that your school had earned. As a reward, no practice was scheduled that afternoon: "Take a well-earned break," said your coach. You wandered out to the parking lot and talked with friends. Just then, your coach walked across the lot and met a man waiting by his car. You recognized him as the "organizer from the Model UN Conference." They greeted each other and she jumped into his car. You asked if anyone knew with whom your coach drove away. Someone said, "Oh, that's her boyfriend, they've been seeing each other for a couple of months."